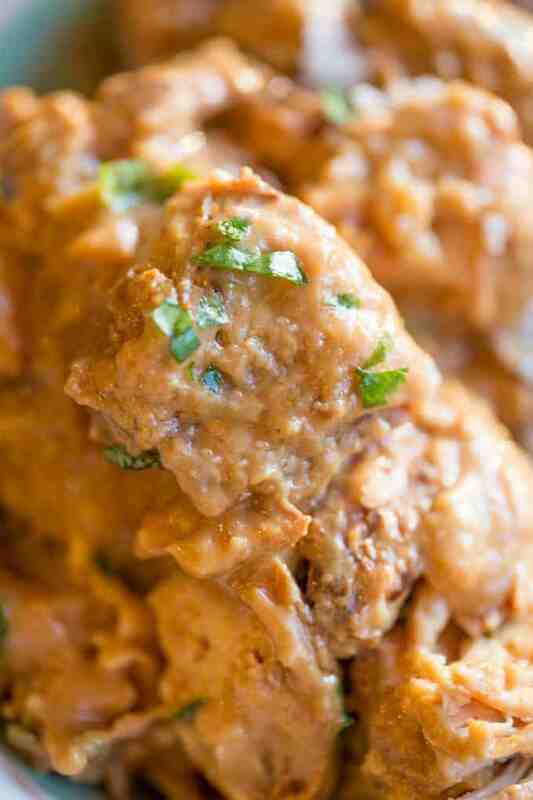 Slow Cooker Thai Peanut Chicken is one of our favorite meals because the kids love it so much. 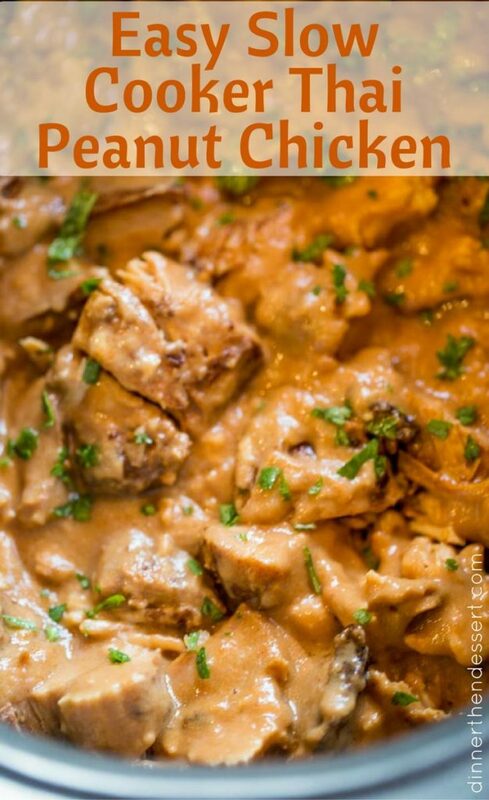 I find that any time I can add peanut butter to dinner that doesn’t include a sandwich we tend to be happier as a whole family unit because a huge pet peeve of mine is making multiple meals. It happens more than I would care to admit, but on nights when I make something everyone will happily eat I feel a lot more at peace. 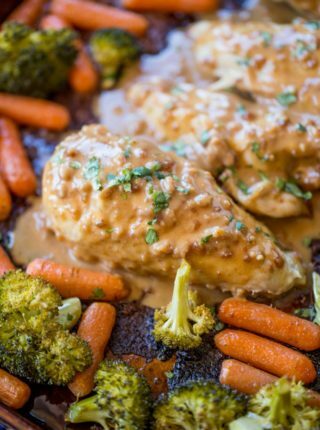 This recipe is the slow cooker equivalent of the Sheet Pan Peanut Chicken and Vegetables I posted last week. In the less than ten days since it was posted I got more than a dozen emails asking for a slow cooker version of the recipe. I love this about you guys, you know exactly where I am headed with recipes! I replied saying it was already scheduled for today and you guys were so excited. This brings me to one of my favorite things about how engaged you all are. If you ever want to see a recipe on the site or have a favorite you’re looking for, please email me! I am totally open to hearing what you guys want to see more of (and yes I know the following: Bacon, Oreo everything and slow cooker). You can email me at contact @ dinnerthendessert.com. By the way, I just want to say how much I love you all and your love for all things bacon, 6 of the top ten recipes on the site have bacon in them! 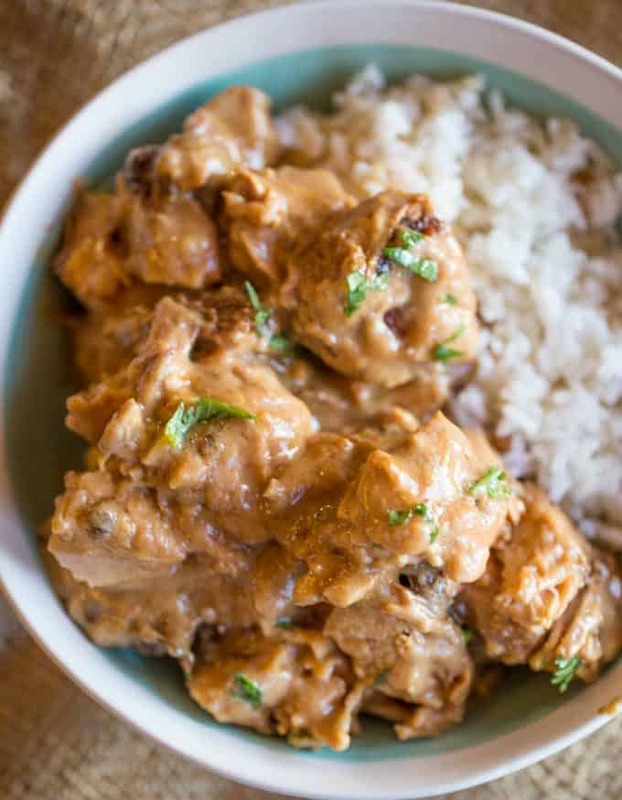 This Slow Cooker Thai Peanut Chicken intentionally calls for only a half a can of coconut milk because every time we make this we use the leftovers in our rice. What we do is cook our rice as you would any regular rice, but replace some of the water with the rest of the coconut milk and usually whatever lime juice is left in the lime we are using in the recipe. 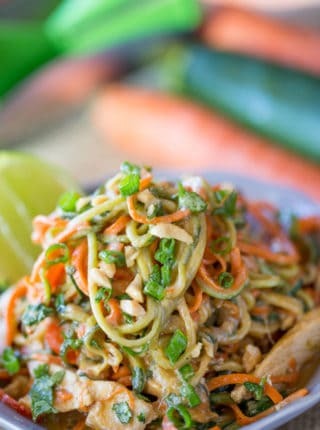 Served with some roasted Garlic and Ginger Carrots this is a meal your family will enjoy for a long time to come. The best part of this is also that it is almost completely hands off. You start the chicken in the slow cooker and when you are about a half an hour away from dinner you put your carrots in the oven and make the rice in your favorite rice cooker. Anytime meal prep can be this passive is a win, there won’t be anything cooking on your stovetop for you to watch. You can cut up the chicken and add the ingredients into a large ziploc bag/bowl the night before if you’d like then you can just put it in the slow cooker in the morning. If you are making this fresh in the morning you can brown the chicken before cutting it up and it will add a deeper flavor. Using chicken thighs can keep the chicken moister and allow for you to cook it longer (7-8 hours on low) if you will be away all day. I recommend boneless skinless thighs for this since the skin would add a lot of rendered fat to the sauce. There are some pre-made garlic and ginger pastes on the market that you can keep on hand if you find that you don’t want to have to keep fresh ginger and garlic in your kitchen. You can easily make this dish on your stovetop or in your oven as well. Add the ingredients to a dutch oven and cook in the oven at 375 degrees for 30 minutes or on your stovetop (covered) on medium heat for 20-25 minutes. Low Sodium Soy Sauce – I find regular soy sauce much too salty, remember you can always add salt but you can’t subtract it. Starting with low sodium allows you to alter to your tastes if necessary. 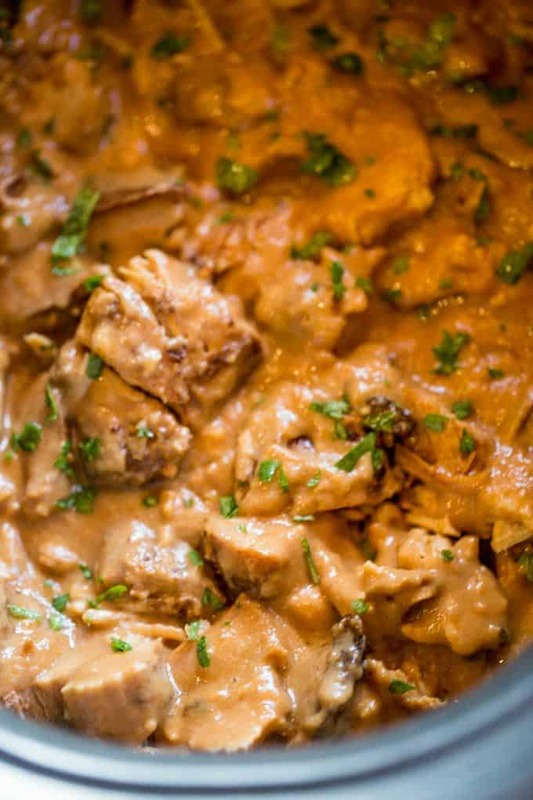 Coconut Milk: I stick to the full fat for the thickness and creaminess in the dish, if you want to stick to a lower fat alternative you may want to cook this on the stovetop as it may break the sauce in the slow cooker. I made this for tomorrow’s dinner. After reading some of the previous comments about the dish being bland, I added a half cube of chicken bouillon and a pinch of red pepper flakes to kick up the flavor. I also swapped the soy sauce for liquid amino. The flavor is just to my liking. I’m sure it’ll be even better tomorrow after the seasoning settles and I add the green onions. So glad you were able to customize it to your liking! 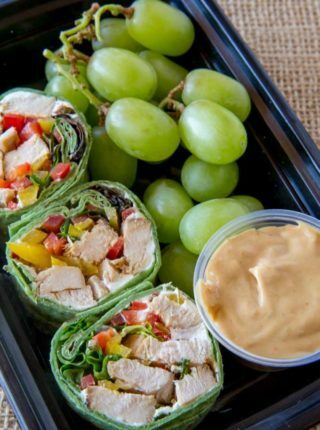 This looks delicious; I am going to try it! 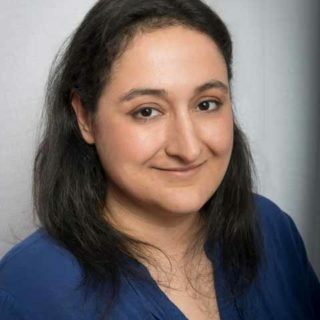 Hey Sabrina, when you refer to a boneless, skinless chicken breast, what is the approximate weight? The size of a chicken breast can vary greatly. Thank you for posting all these yummy recipes! So glad you’re enjoying the site. I would say the average size of chicken breast is around 4-5 ounces. First taste is wow! I added a teaspoon of Thai chili paste and a half a cup of chicken broth as I made it in the poultry setting on the instant pot. Plenty of flavor. Delicious! So glad you loved it! Thanks so much for the 5 star rating! Did you follow the recipe, but simply poured everything into the Instant Pot? Did you brown and/or cube the chicken first? Sorry for the questions – I just got an Instant Pot and don’t want to blow my first meal prep! Thanks! Made the recipe with boneless skinless chicken thighs. Turned out perfect. I made this recipe for dinner today. Found it a little bland for my taste like something was missing. Is there a spice I could add to make it more flavourful for my liking. DELICIOUS!! 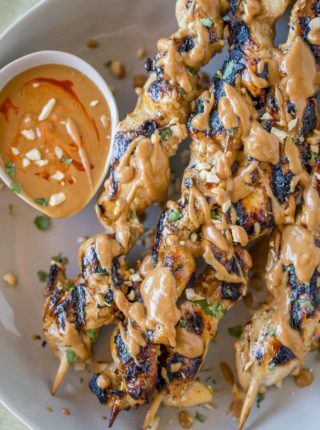 When we can’t get across town to our favorite restaurant, Phan Shin, we can have peanut chicken right here at home. Double the sauce – you’ll thank me! I chose the oven option and it worked just fine! Oh my goodness you are so kind. Thank you for coming back to leave a review! 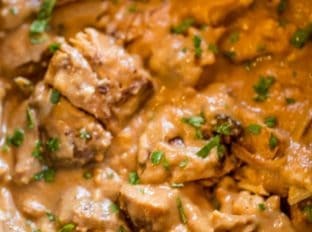 I think this is very nice recipe that you can easy spice up if you want. One thing I’d like to point out to people ,is that Slow cooker temperatures can vary,so knowing your slow cooker is important .I’m lucky enough to own a 30 year old slow cooker that cooks at a lower temp than today’s pots ( a ruling on temps was changed years ago) so can easily cook chicken all day with no problem. I have heard that some of the new one pots are more variable with the slow cooker temps. Also chicken breasts dry out quicker than thighs. Hope that helps. I made this last night in a Mealthy pot. I added 1 1/2 cups chicken stock, increased peanut butter to 1/2 cup and added 1/2 can of coconut cream instead of coconut milk. Cooked on poultry setting for 15 minutes with natural release. I added 1 can of sliced water chestnuts and chopped green onions after cooking. Everything else was as directed in the recipe and it turned out great! Served with rice cauliflower with peas and carrots, sauteed in remaining coconut creme with lime juice and cilantro for a quick healthy supper. Family loved it! I’m so glad everyone loved it! Thanks for the 5 stars! Wow. Another keeper. I added a generous amount of ground black pepper before the final 20 minutes. I used Pics smooth peanut butter which is made in Nelson, New Zealand. 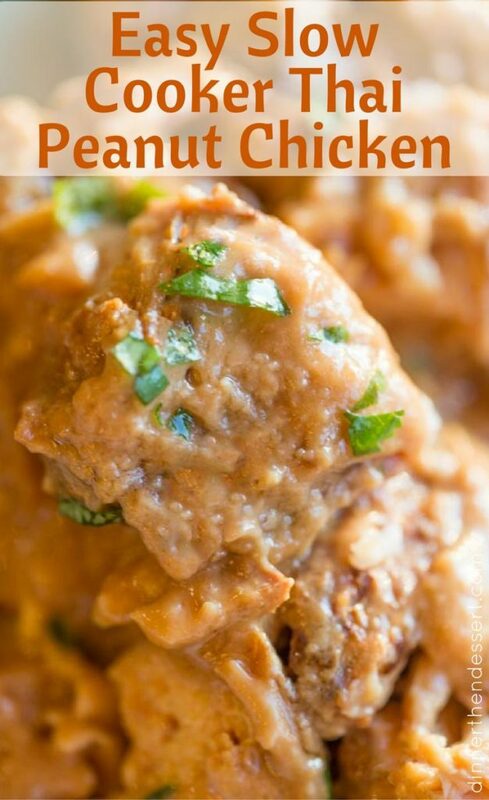 Can I make this w/chunky peanut butter? Has anybody thought about adding curry powder to this? Or red curry paste? Would love some input!! I followed the recipe to the letter. My family was disappointed in the meal. Very bland. If there is a next time, I’ll use chicken thighs and brown the meat before adding it to the slow cooker. Almost no peanut taste; added cilantro, chopped peanuts and green onions and it was still very nondescript. As some of the others have written, there was just something missing. My results did’t even look the same. It looked like chicken in a light b brown gravy. I made this last night. It is yummy, but needs a kick of somekind…a bit bland. I am going to try it next time with veggies instead of chicken and a kick of pepper. VERY easy to put together! Delicious & EASY dish. I used thighs but forgot to pick up fresh ginger.. I added ground ginger & prob wasn’t quite the same. It was wonderful, nonetheless! Thanks for a great recipe. 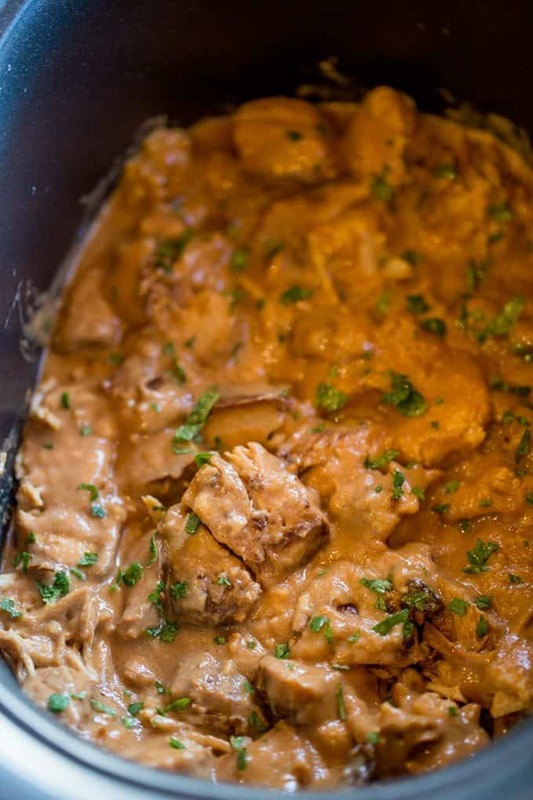 Are you still happy with the, then new, slow cooker you used when you made this? I read a lot of bad reviews on amazon about the non-stick coating coming off. I absolutely love it and haven’t had any issues. How wonderful, Ellen! So glad you decided to give it a try! No idea what I did wrong, but the oils seemed to seperate from everything else when I let it sit on the stovetop. Browned the chicken, used thighs instead of Breast and followed the instructions. Help! I made this for lunch today and everyone (3 men, 2 women) enjoyed it. Next time I make it, I will double the lime juice and add a little bit of either red pepper flakes or jalapeno pepper for a little bit of kick. I found it to be slightly bland. Others in my family suggested adding peanuts for a bit more flavor and crunch. I will make it again.